BMF student guestblogger Bubba Ayoub: Epic synth parts! 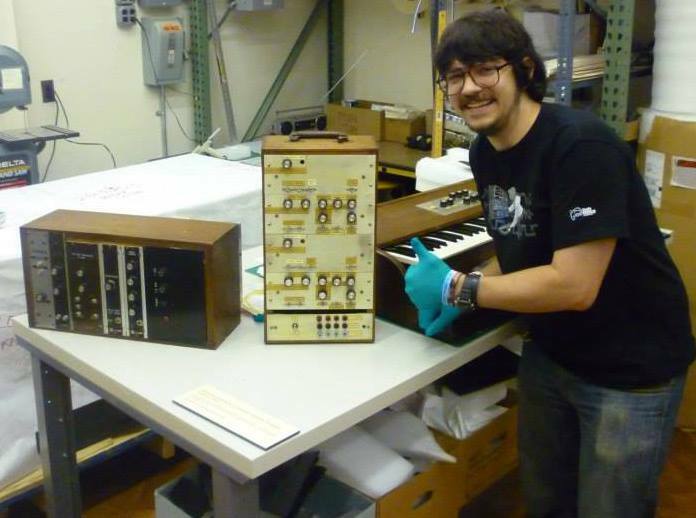 Our guestblogger Bubba Ayoub continues to share his thoughts on Moog, music, and technology, this time sharing some of his favorite synth parts. Enjoy! Rick Wakeman‘s solo spot in Yessongs is one of the great Prog Rock Keyboard Moments. In the Yessongs era, his Minimoog usage was fairly modest. At its height, he toured with nine Minimoogs (three onstage and six backups). At a bare minimum, I want you to take a minute to realize just how beautiful Keith Emerson‘s Modular Moog is. Your synth will never be as iconic and badass as that one. And oh boy, does it sound amazing. I had the Yes Live at Q.P.R. video on VHS. I distinctly remember watching it with my dad and one scene has stuck with me my whole life, influencing everything I have ever done since. The thing that’s awesome about it is that the Minimoog is comically out of tune. I mean, oscillator drift is real, man. And holy crap was it real at that show. And he tries to fix the tuning too, which is even funnier because that part is fairly intricate and short, and wow, is that puppy completely gone. So he just decides to run with it and careens through the part with reckless abandon. And that’s kind of how I’ve decided to live my life in some ways. I’ll try to fix stuff, but if I see that it’s a losing battle, whatever, just run with it and make it work anyway, y’know? Sometimes you’ve just gotta embrace the rain when you’re on the lawn at Pine Knob, and your synth is deathly out of tune for a big, important solo moment. Just roll with it and hope someone can laugh about it. BMF student guestblogger Christian “Bubba” Ayoub is a former member of the Maker Corps of the Henry Ford Museum, where he designed teaching plans meant to bring innovation into the classroom using the collections of The Henry Ford Museum and Greenfield Village. He has presented ideas at Maker Faire Detroit and the May Tinker Hack Invent Saturday at the Henry Ford Museum, made artbots with the public at the June Tinker Hack Invent Saturday, and taught workshops to teachers looking to bring Making to their classrooms. He began playing synthesizers at age 10 because of a love for progressive rock bands like Yes and ELP, and voraciously seeks new and interesting music to listen to. His Juggable Offense project is an ever-shifting mass of psychedelic space rock centered around modular synthesis, Moog equipment, and sonic exploration. Bubba, In regards to the ELO track- Check out the compilation Mr. Bluesky on Frontiers/Big Trilby records. Jeff Lynne has tweaked all the tracks within and Richard Tandy’s Moog bass on Turn to Stone does appear to be more forward in the mix. Thanks for a great couple of articles!